If you said 'bin' or 'bucket' walk 'The Walk of Shame' and go to the back of the class (which incidentally was the instruction given to all students who dared to be late for my lessons : one day I was late (bike puncture) and had to walk my very own 'Walk of Shame' : Mrs Doasyouwouldbedoneby was my muse....) ! I used all 'pin stock' making this! I woke up one morning and had it in my head that I had to make this BAG. It took much longer than I anticipated but I wanted to 'create' (fancy) a bag reminiscent of the 1940s with a 'handmade/homemade' look. This shows the work in progress and during the 'bucket/bin' stage. It took me ages to make a pattern : you wouldn't know it looking at this photograph as it all looks so simple (in truth this was partly because I couldn't find the grease proof paper and then decided to tidy up some drawers in order to avoid future grease proof paper showdowns). The whole thing was a bit of a fiddle faddle to be honest and this is a shame as I really thought that I had 'discovered' a new 'Bag Opportunity' (aka B O). In my mind I knew that piping was essential............I can offer no explanation for this. I was pleased with the pipe work especially as I do not possess a special piping footer thingy ('She who does not pay for the piping foot calls the bag a ruddy pain...'.). I am very annoyed that I had not noticed that stray thread in the middle of the photograph - apologies all round for that. I strengthened this bag with interfacing, soft interlining and lining though this also meant that at times I was trying to sew through many, many layers of fabric. My sewing machine is RUBBISH (and I don't have an overlocker/underlocker/footlocker or indeed hurtlocker...) so at times there may have been a little bit of **^! ** huffing..... However all of that, and the little stitches around the base, meant the bag could stand up independently. Why I wanted a bag that could stand independently I cannot fathom but there it is. 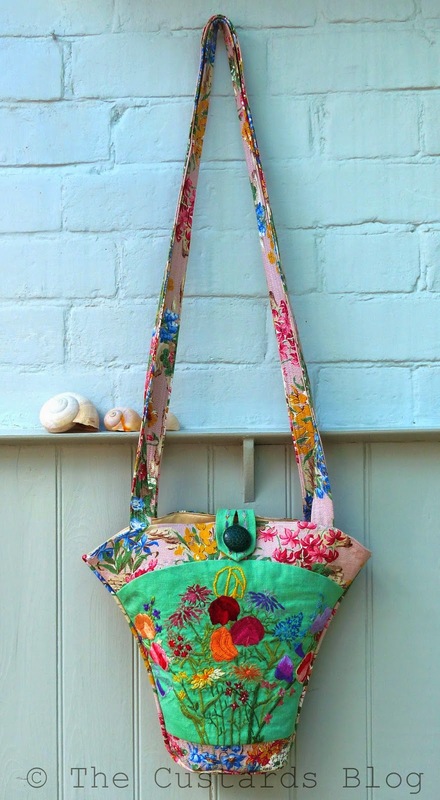 Here is the finished bucket bag not standing independently (after all that fuss!). The motivation for all this bag making was D Day : I planned to wear it as I cycled along the seafront to watch the service and thank the servicemen and servicewomen. Again for reasons I cannot fathom I thought that it would be appropriate to don my best embroidered apron. You don't have a best embroidered apron? That is a bit of a rum do if I may say so. I have photographed this before on Flickr but as that was a few years ago I hope that it is acceptable to show it again. I thought that the blue birds were apt and of course it also meant that as I cycled I could channel Vera Lynn and 'sing as I go' (a bit of Gracie Fields thrown in for good measure there). As I tra la la'd along everyone would clearly understand the connection between my singing, the apron, the home made bag and the day itself. In order to demonstrate the stitch density here is the reverse. If need be I will do a post on embroidered aprons (as opposed to the fabric type representing each decade..... OH COME ON - YOU'RE THE SAME!). Did you see what I did there? Blue birds again. I was going to dig out all my old Blue Bird tins but NO. It is good to know when to stop. Oh I did however lighten upon my old paper doiley collection (OH COME ON!). Of course I have some 'penny plain' pretty paper doilies but the 'tuppence coloured' add a bit of 'je ne sais quoi' to one's day don't you think. Paused to read Mrs Fussepottle's latest post whilst working my way through the odd Tunnock or two. I found this article to be very interesting though I was perplexed by the absence of full stops throughout. The advert reminded of another Vera Lynn song. Can you guess which one? Oh...... I may have made a purse too. Every 6th of June I visit the D Day museum so this year would be no different : I parked my bike outside and trotted in. About half way round I was reading about Southwick House - I was bent right over the information board (I did go to Spec Savers but glasses are rubbish) and someone said excuse me. I turned round and blow me down it was Winston Churchill's granddaughter. Now I should point out here that I am not usually familiar with the offspring of world leaders - for example in a line up I would not be able to identify the children of: Stalin, Lloyd George, Metternich or Hannibal. I had however been watching 'The Great British Menu' and seen said granddaughter on the telly only a few nights previous. I was going to mutter something about liking Aktar's rice pudding ( I LOVE rice pudding) ice cream but just said: ' Thanks for all your granddad did' and tra la la'd off. I reckon that she was too taken aback by the bag/apron combo to say anything. I watched The Red Arrows fly over The Solent - hope that it is ok to show these photographs as I don't usually show new things! When I took these I was just pointing the camera randomly in the sky so I was quite pleased to find that I had managed to capture anything. On my return to Custard Towers I ate an ice cream which I kept cool in a home made (see what I did there) mini ice bucket (made the night before using the bottom of a plastic bottle and a few flowers thrown in). This is the type of nonsense which adds a bit of pleasantness to the day I think and costs nothing but time. Some people write whole books telling you how to make such things! A full frontal bag shot. PS: Very, very interested in how this blog 'reads' so I am keen to respond to enquiry regarding loquaciousness. Thank you to Susan C and thewoollydog for further probing regarding this matter. Loquacious is a most marvellous word I think - see I have mentioned it twice already and we're not bored...... Along with quark 'L' has a wonderful ring to it. Anyway I spent a while considering whether or not I might be in the 'L' category and also if I would wish to be in that cohort. I think the answer depends upon the circumstances. I hope that my endless chat is/can be tempered with sensitivity if the situation demands and in my nursing life I spent a great deal of time with others in complete silence (sister in neuro intensive care and also caring for the suddenly bereaved). In other situations I am quite a garrulous fellow and love to use hundred words rather than a handful (though I do hope that I am not one of those 'centre of attention, listen to me' types!). I revel in the English language : its nuances, twists, turns, mixed meanings and the humour within it. I grew up listening to the Radio 4 and one of my favourite programmes was 'My Word' with Frank Muir - that clever use of words stuck with me. Someone that I used to work with once asked why I 'had to use those long words' all the time...I remember being a little hurt....then I asked her why she just used those same old short ones day in day out ! A bit VERY conceited and of course I haven't selected any rubbish comments (cheeky!) - but just to show that chat can be good in the right places. Singing a song in order to remember equations has its place in the world! My talkativity gets me into a pickle sometimes and here is a typical hapless situation. Recently I drove Bronte and her friend to the shops : chatting and singing all the way. Upon reaching the car park I parked too close to a pillar (rubbish at parking) but, as I was still talking and keen to finish the story off, I thought that I would simply clamber out the passenger's side rather than move the car. Still talking (loudly as both passengers were now outside of the car...looking a little bemused) I did not think it through and proceeded to extricate myself from the passenger side horizontally and HEAD FIRST. As my head peeped out of the open door I started to laugh at myself and then could not maneouver my hulking body across the 'gear stick/hand brake'configuration in order to complete the extraction. I was determined to finish my story (goodness knows what it was about) whilst Bronte stood there shaking her head, saying: 'Why oh why...'. Later on I had to reverse the procedure in order to get back in....this time I was by myself so didn't feel the need to maintain any decorum (!) ..... as I clambered in I noticed a man a short distance away, talking into a mobile telephonic device, looking slightly alarmed! PPS: June whizzed by didn't it....... I have been very busy with work...ploughing on but looking forward to a summer break of sorts. We have also had the builders in knocking down a wall and doing bits of construction work...oh the dust. You may recall that I have been saving my pennies for some time in order to 'revamp' the kitchen: Dom decided that we did not need a new kitchen (he is right - we don't 'need' a new kitchen.....so-called 'First World' non-existent problems' I know). However a year or so ago I resolved to save all most of the money for it myself and that is exactly what I have done. I am currently contemplating Phase Three which is new kitchen floor (as it will take a week this will need extra loin girding and extra funds). 'The Gas Men' was Phase One, with the knocking down of a kitchen wall and putting in folding doors being Phase Two : both now completed. Next month I will be paid for an extra contract which I took on in order to fund a cupboard building venture (Phase Four)! I endeavour to have it finished by Christmas ...................................... possibly..............given that over ten years ago Dom put in a 'temporary' kitchen I can wait a while. Phase Five will be product placement, sponsorship and photographs! And 'my' builders who have been coming here for years - this may have something to do with the homemade rice puddings and steamed treacle sponge. I love my builders and I know a great deal about their lives (just like the Gas Men), trips to New York to listen to Woody Allen, accidentally chopping down Albert Finney's rose.... a long story which I asked to be repeated the other day as it makes me laugh so much. People have very interesting lives. PPPS: In between we have been on our annual camp where 45-50 families go camping in The New Forest. This year the theme was 'Heroes' and it was clear that lateral thinking had gone into some of the outfits. Our friend Claudia is always able to produce the most splendid original outfit (her mum once supply original costumes to the BBC for one of their drama productions): this year she chose to be a Suffragette, though the beautiful Edwardian jacket was too small even for her. Turned out that there were five Suffragettes in total. PPPPPS: It is my intent to have a 'giveaway' soon : is there any appetite for this sort of thing nowadays? If so I will strive to create one or two 'somethings' within the next few weeks. Given my low batting average of one or two posts per month it may be a little while...sorry! I promise that there will be no 'guess the colour' this time round or 'my first is in custard but not in milk' type of question....it will be simplified....sort of. Finally PS: Welcome to new followers - if you can make any sense of all of this I will be amazed! I love your fly-past photos. I was present at the Red Bull Air Show in Budapest in 2005 - but with my new camera I only managed to take lots of pictures of clear blue sky just vacated by the planes! Re Mrs Fusspottle - were we thinking 'Up the Wooden Hill to Bedfordshire'? - anothe rof Nana's pet expressions. My Dearly Beloved has started to worry lately that I have concealed my true age from him, and that actually I was alive and kicking during WW2, because I seem so au fait with this period in our history. Hoping all your kitchen work proceeds with less stress than Jennifer Aldridge is experiencing in Ambridge. Your BAG is breathtakingly beautiful. After catching my breath, I wept a bit for added emphasis. Forget the shops. It belongs in the V&A. Oh my! I trust that you have fully recovered my dear! It's a beautiful Saturday morning in New York City. I have a weekend home delivery subscription to The New York Times, and was really looking forward to reading some of today's paper before I had to head downtown to work. Yes, I am working this beautiful weekend. The paper was not delivered in time for my ham and eggs and juice and coffee breakfast. The paper still has not been delivered as a recorded telephone message promised a couple of hours ago. Irritation was clouding my no longer early morning. And then...I switched on the laptop and found this glorious post from you. Wow! Your embroidered bag is such a treasure. Every single bit of the design and execution fit together perfectly. Yes, it could easily become part of the V&A collection. I have so enjoyed reading every single word of this post, and found the mix of the photographs quite complementary to your prose. My earlier irritation has flown away somewhere, replaced by images of what imagination, talent and daring can accomplish. Now we know why we love you and why, we suspect, you had so many devoted students. You are a 'one off', uniquely you, definitely different, a woman out of her own mind, an independent thinker, baker and bag maker, a lover of life, a thrifty, nifty needle woman and all round good egg. Indeed, how many ways are there to extol your virtues? We shall try to find them! This post is a triumph, fully worthy of a D Day celebration in itself. The bag is truly wonderful. We want it and we want it now. As you are fully aware, we live for the most part in the 1940s, that is when we are not living in the 1890s and so the bag is essential to our daily lives. Of course, we should not sully it with shopping. It would be purely decorative, carrying only a crimson Chanel lipstick, a point and shoot camera (what self respecting blogger can go anywhere without his/her camera?) and a silk handkerchief monogrammed H (share and share alike). The embroidery work is so intricately beautiful and the choice of fabrics charming. With this bag we could go places.....and go we would! As you also know we are never to be found in a kitchen but, darling Jenny, your builder men look divine. Now, that would be worth venturing near the cooker. We need a little DIY carrying out here in Budapest, do they travel? I am awash with your kind words and lifted with your comments. My virtues are fully extolled!! Lovely to see you here and thank you for your kind words. I feel that there might be more piping in the pipe line now! Dear Jenny, how much I love your posts! I don't mind how often you post but please keep them coming!! Gorgeous bag, such a great shape. Well worth all the huffing and puffing involved in making it I think. Thank you for double comments! I will fashion a giveaway for post-summer and pre-winter!. Dear Heather - I like that idea of a flower bag (in all senses). I climbed in the car sideways (in truth this was in part because I was just recovering from a displaced disc so I was trying to avoid certain positions! Your little purse is beautiful! I think you should be selling those. I love reading your posts. You are such a good story teller and I always enjoy visiting you. I love everything you make but that bag is something special. Your posts always bring a smile to my face. Absolutely beautiful. You've made me itch to stitch!!!!! You would think wouldn't you. I am hoping that some Overlocker Magnate is reading this! Oh God Jenny I LOVE you to pieces! I'm adopting you into my family...sorry bout that, no official duties are required and no legalities will be filed but you are from no onwards a part of my quite bonkers family. I cried at your story of parking as I have spent many a time squeezing my ample parts from various vehicles whilst still rambling a long forgotten (and in my case rarely interesting) story. Right.....hopefully blogger will play nice and I can actually publish this comment......as I was saying.......I came over all faint like when you mentioned my name in print.....ohhhhh quite had the vapours. I get my use of words from the manic act of reading, and I mean reading anything and everything, if there is no magazine in the loo, hello my friend shampoo bottle! So I looked up the strict definition of that thing I suggested you were and had to laugh because the literary example given here would actually describe me. Just call me Hetty. Talkative or chatty, especially of persons given to excess conversation. On the other hand, Hetty was moody and silent. She was never loquacious, or if she occasionally became communicative, it was under the influence of some temporary excitement that served to arouse her unsophisticated mind; but, for hours at a time, in the course of this all-important day, she seemed to have absolutely lost the use of her tongue. I can identify with that temporary excitement! Your (bucket) bag is such a fabulous shape - it must have been tortuous to get together me thinks. The Red Arrows shots are cracking - you could well flog those I'm sure - so professional! The suffragette swigging out of a bottle tickled me as did your prose. Such a funny blog! I have taken some rose cutting again and so far they seem to be ok! I'm left reeling slightly after reading your post, but in the best possible way. You are so funny! And you love the English language and use it with joy, relish and abandon and that is to be celebrated. I need to say Ruddy Hell a lot more. My parents have some excellent phrases: "Hell's bells" being a favourite of my mum's and "Golly" or sometimes even "Golly Moses" from my Dad. No idea what that means but I think there is room for all of these in my daily chatter. I too LOVE your blog. Please don't change a thing! It is gorgeous. Bag / bucket and blog. Oh Jenny, I think you need have no worries about how your blog "reads"... it is a thing of wonder, as is the embroidered bag. I take it the embroidery is a vintage one, rather than one you have done yourself? It is wonderful either way. Having become recently self-conscious about overusing the word "lovely" I appear to have swapped it for "wonderful", so I'll just say that I find your posts both wonderful and lovely. And I am really glad that your builders are nice as well as good looking, I yearn to find builders that are both competent and polite - good-looking would be the icing on the cake. I had two rather good-looking garden men round the other night to quote for rebuilding our crumbling patio but as they were also hideously expensive I don't think I will be gazing upon them again. By the way, I forgot to mention - I read the introductory message at the top of your home page as "Welcome to the Custardsphere" - love it, a perfect description! Have a wonderful day, and sorry I'm late reading this, have been very absent lately! Thank you so much for your generous words - I will do a giveaway after the summer now I think. What a post! You had me LOL, staring at that amazing bag of yours in awe and looking at that, you say, lucky shot of in which the aeroplane and all the colours feature. You are a really talented lady! I don't follow your blog long enough to know what you teach, but if you teach textiles, I would love to be in one of your classes. Wish I could embroider like you! Love your living room bye the way.....the light, the space, the windows........Beautiful! Hello again and thank you so much for your kind words. I now teach student nurses mainly - so anatomy and physiology, health promotion and so on! Not a great deal to do with textiles sadly. That stretch of coast is lovely isn't it - lots of pretty villages along the way too. Come back again soon - especially as the weather is nice for a change! Thank you for your generous words - handles not too long (I always put them against me for size before I attach!). Your post is a wonderful read! The bag is superb,and the piping is perfection. Being very nosey, i can't wait to see your kitchen-if you will show us when it's done-pleeease. Lucky you were not saying anything silly when Churchills grandaughter was behind you.Years ago we visited a stately home, and we were discussing a painting of a man-who must be the owner, and a lady- who must be the daughter.We met them in the house, and they were actually husband and wife-Ooops. Thank you sooooo very much for your kind comments. The weather has been the nicest it has been for donkey's I think - no wonder we are all out playing! I wanted to say thank you for your kind comment on my blog! Hope you had a good time today in Lewes. We drove through it on our way to Brighton. It looked like a lovely town. We visited many years ago, but I believe at that time we did not get further than the high street :-) The girls being tired! Dear Jenny, it is another sunny morning and reading your post has made me even happier. The bag is a thing of beauty and although I cannot sew, I am now tempted to make a small cushion... that would be a life-shaking project for me! I'm glad you love words too. Somebody once snarked at me for using 'clever' words and asked me why I do it. I didn't have a reply then but the answer is, of course, they say EXACTLY what I'm trying to explain! Keep up with the words!!! Jenny your bag is adorable and if I ever see a woman (of a certain type) with a bag like that i will rush up and hug her you have been warned...! ps your builders are quite handsome! PPS I am now in need of a cup od something my blog reading eyes are full to the brim with wonder and ideas after reading this. Thank you for tears of laughter. Going thru a time of grief, so very much needed.